Locate autostrada A-1 (from Rome to Napoli). 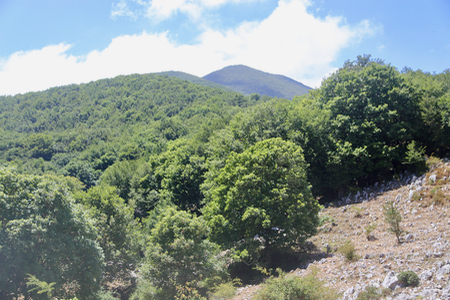 Just south-east of the town Cassino, take Hwy. SR-630 south. Exit Hwy. SR-630 at location N41.27948, E013.71394, this is about 3 kilometer before Santa Croce. 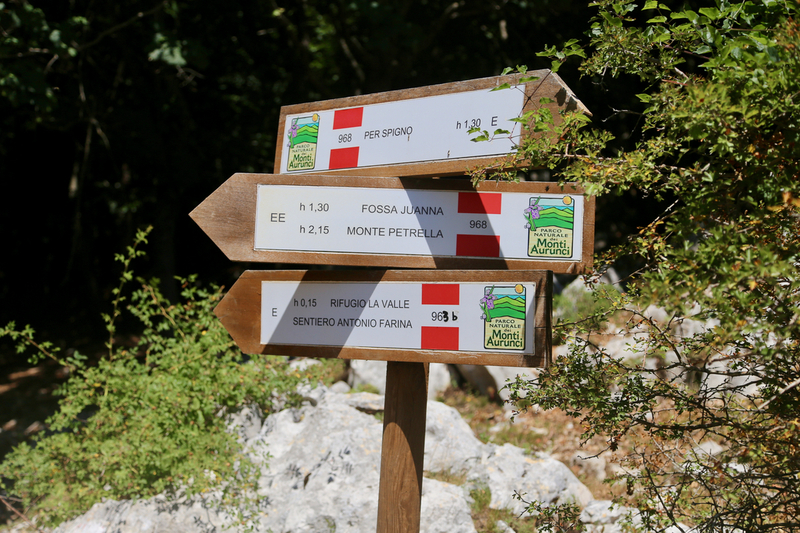 Drive uphill to the tiny village of Spigne Saturnia Superiore, just as you enter the main square, make a sharp left to continue uphill, then more traversing (right) to get on the road that climbs high up in a small valley. Both the lower and the upper trailhead are located along this road. The lower trailhead is at N41.32264, E013.69945, elevation about 450 meter, while the upper trailhead is located at N41.33187, E013.68536, elevation about 920 meter. The road from the lower to the upper trailhead is paved about 2 kilometer, then continues as a rough dirt road (normal cars can drive with care) for another 4 kilometer. From the (lower or upper) trailhead, follow the well marked and big trail as it zig-zags up the valley. You will arrive at the col where there are trail signs and corresponding trails forking. 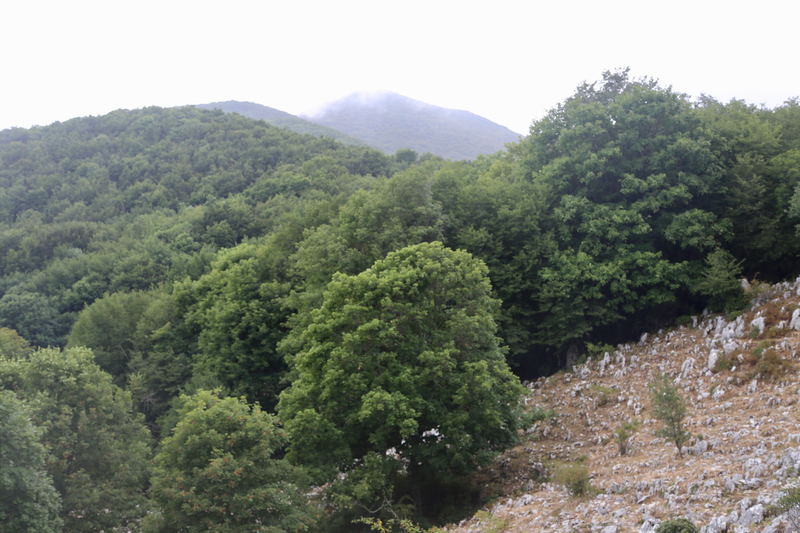 This location is N41.33471, E013.68054, elevation about 1145 meter. 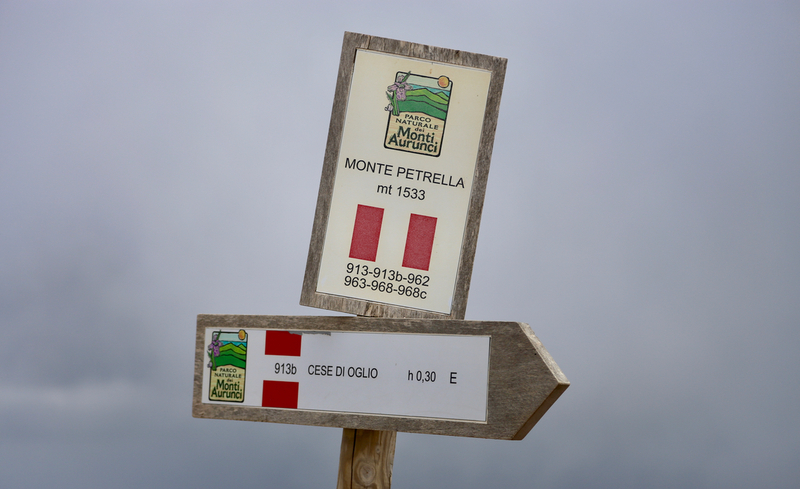 Take the left fork, signed for Monte Petrella. This trail sort of contours fairly level along the hillside, then climbs gently. This trail is obviously not hiked frequently, one should pay attention to the red/white marks on trees in order not to loose it. The (best?) marked trail makes a considerable detour and I still lost it eventually. Thus, it is better to keep an eye on your GPS, then head off-trail directly for the summit when you are appropriately close. The terrain is pretty Ok to walk also off-trail. I drove to the lower trailhead, the map indicated that the road climbed higher and as I did not see any sign preventing driving, I continued carefully uphill. After a few kilometer the pavement ended and a somewhat rough dirt road continued. Still, very driveable with a normal car. I parked near the upper trailhead where the road ends. I started hiking at 1045, the big trail was easy to follow. After about 20 minutes, I reached the trailfork near the col. I could see what had to be Petrella, slightly clouded. The trail now got much smaller, still pretty well marked, but obviously very little use. I hiked along following the red and white markings until I emerged at some slightly more open terrain. Here, I checked my GPS and observed that the trail had taken me in a big loop, a pretty obvious detour. It seemed that I somehow had failed to notice a trail forking more left and running directly to the summit. 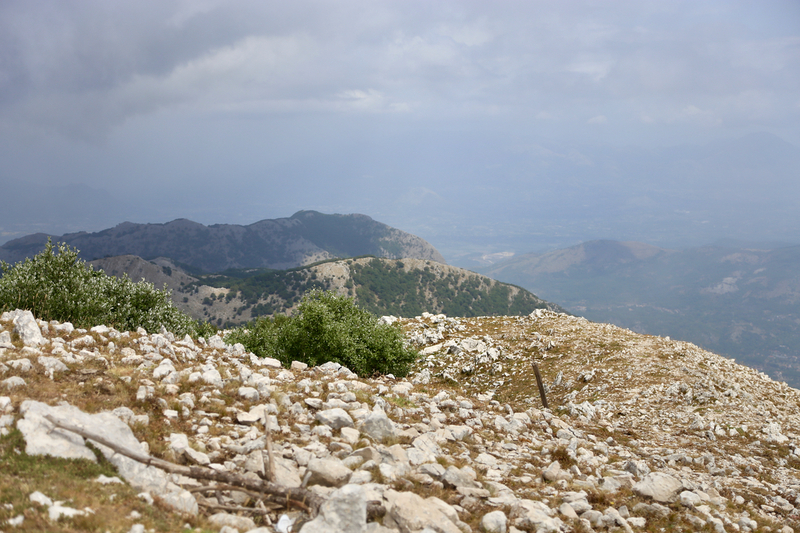 In any case, I continued, now more directly towards the summit - and then quickly lost the trail. I crossed sloping terrain with tons of leaves on the ground making the walking quite slippery. 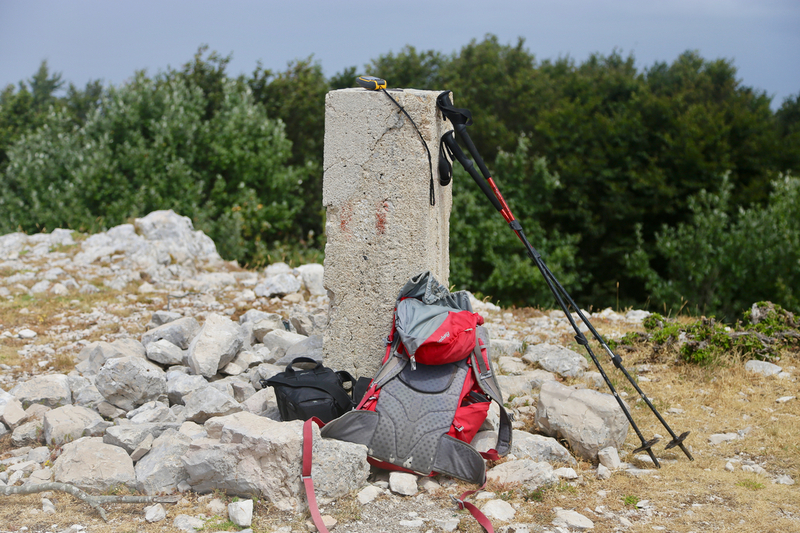 After quite a bit of time (seemingly), I arrived directly at the summit. The time was now 1220. Clouds obscured most views, I could barely see the houses below the mountain, fairly close to the coast. 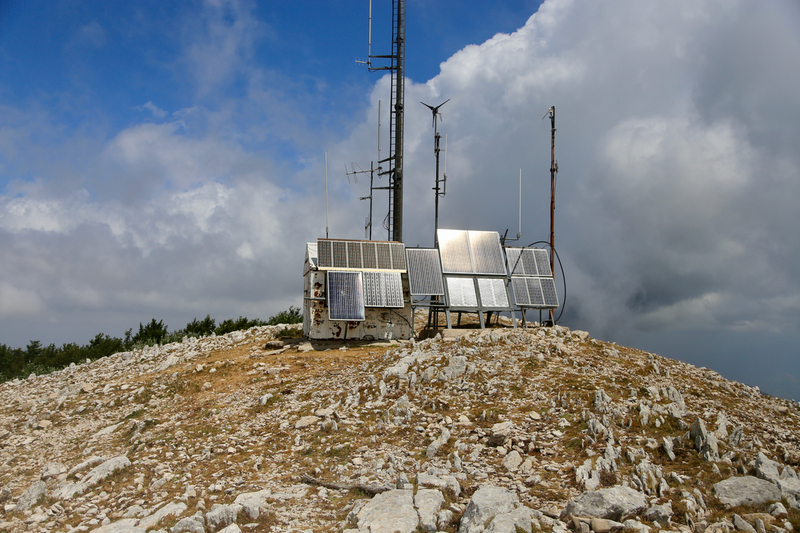 The summit had a solar powered antenna system. After a rest of about 15 minutes, I started back down, this time determined to follow the correct trail. There was even a sign at the summit pointing the correct way. Not much luck with this, I lost the trail after only 100 meter, no marking, and really no trail either. Proceeding off-trail, I first tried to stick to the trail that was marked on my GPS map, but as this became cumbersome I headed more left and downhill in order to regain my track when hiking in the opposite direction. I got back to my old track, but the trail was still hard to find. Rather mysterious as I definitely felt that I had followed some kind of trail when going the other way. Eventually, a trail presented itself, by this time I was almost back at the major trail fork. 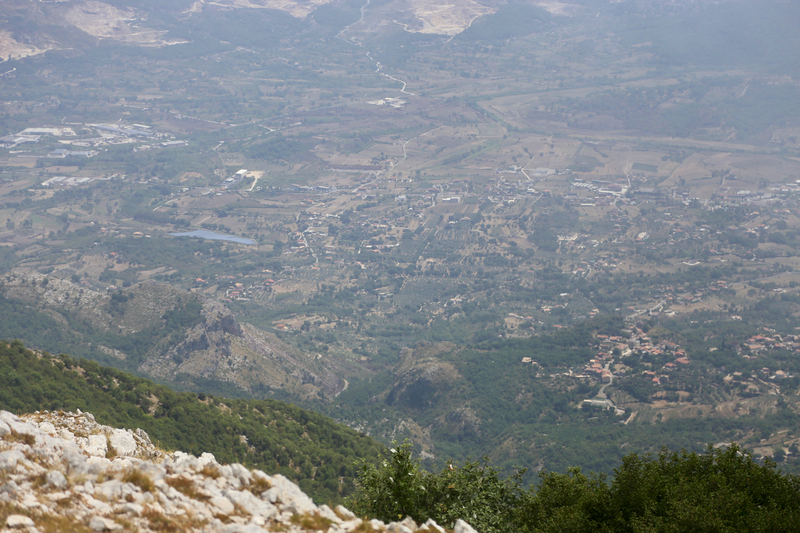 The rest was easy and I came back to my car at 1335, so one hour for the descent. Monte Petrella, as seen from the trail fork.